Where to Get Your Hot Chocolate Fix in Belfast! There is only one thing, and one thing only that can satisfy my sweet tooth on a cold weather shopping spree. In fact any trip to the big smoke means cradling a hot chocolate between my hands! Warming and comforting, the chocolatey burst of goodness is all I need to restore my energy and set me on my way for whatever may lay ahead. Or simply provide me with a cosy cuddle! Now, I know how disappointing it can be when your treat doesn’t manage to hit the spot. So although it’s been hard (not!! ), I have done some extensive research so you don’t have to! So without any further ado here are my top three spots for a gratifying cup of hot chocolate. With two venues in close proximity to my favourite shopping locations, you are never too far away from a Ground Espresso. Their hot chocolate pairs perfectly with any one of their superb cakes or tray bakes. I dare you to walk past the cornflake mars bar bun without swooning, or the honeycomb beauty for that matter.... I can also recommend giving their seasonal hot chocolate a go – the current choice being the Orange Hot Chocolate. Served in plentiful amounts, in a trendy mason style mug, just remember to say yes to whipped cream! Located in Northern Ireland’s award-winning indoor market, Ó Conaill Chocolatiers can provide you with the ideal accompaniment to your morning stroll around the stalls. You can choose your own mix of white, milk and dark for your hot chocolate creating your perfect blend. On this occasion I chose the dark chocolate, whilst Mum opted for the milk. The dark was rich and deep, whilst the milk was distinctly sweeter, with a lovely cream finish. 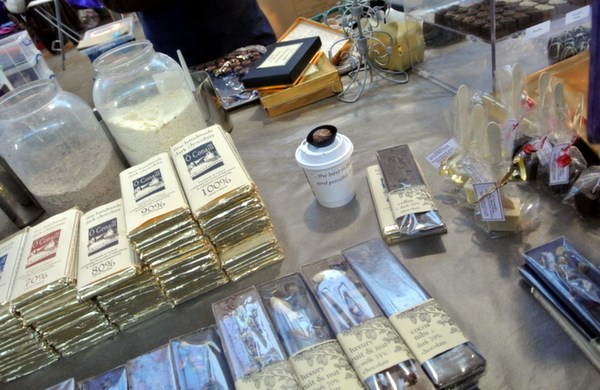 Both came with a chocolate of your chosen variety – and were very much enjoyed. I’m plotting a trip to the market in the near future to sample the white chocolate version. Only last month Co Couture found themselves ranked in the Top 40 in the world after winning silver at the International Chocolate Awards World Finals 2014, with their Japanese Cherry Sencha bar. Now, imagine how good an award-winning Gourmet Artisan Chocolate Hot Chocolate might be – and you are thinking of something nearly as good as this luxurious treat. Thick and indulgent, served with cream and homemade marshmallows, this an an experience not to be rushed. And don't forget to take some chocolates home for later, you are bound to have cravings later! What is your favourite cold weather treat? Have I missed your favourite spot? Tweet me @daydreamfoodie and let me know. Find out where to find more delicious treats in Belfast. Laura Anne Bradley is an excitable food addict, who is lucky enough to work in the wine trade. She has written her food & lifestyle blog for over four years – and is continually looking for new experiences and flavours. On the rare occasion she isn’t eating or cooking, you can find Laura enjoying country life – likely feeding her hens or walking her dogs. You can find Laura on Twitter @daydreamfoodie.